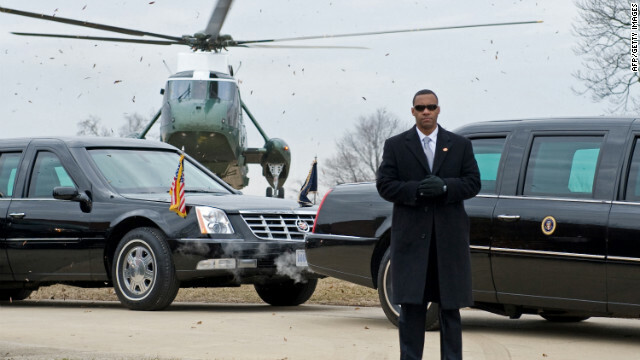 US Secret Service agent stands by President Obama’s limousine at Fort McHenry in Baltimore in 2010. Editor’s note: Jeffrey Robinson is the co-author of “Standing Next to History – An Agent’s Life in the Secret Service,” the autobiography of former United States Secret Service Special Agent, Joseph Petro. (St. Martins/Thomas Dunne Books. Available in both Kindle and Nook.) Follow him on Twitter @writingfactory. (CNN) — So a bunch of guys away from home, who should know better, take off their wedding rings, mix testosterone with alcohol and hookers — an appalling combination — argue over the price of a lady’s company and, all of a sudden, the entire culture of the U.S. Secret Service is thrown into question. All of a sudden, this is the worst disaster for the Secret Service, ever. All of a sudden, the Secret Service is out of control. All of a sudden, anything might have happened, like one of the 11 agents could have been blackmailed to open a door for a sniper or to look the other way as a bomb-carrying terrorist walks up to the president. All of a sudden, the men and women of the Secret Service are no longer the best and the brightest. Especially the men. All of a sudden… Stop! The 11 agents who were sent home from Colombia in disgrace before the president even left Washington were there in a support role. Whether they were manning metal detectors or handling dogs that sweep rooms, whether they were part of a sniper team or standing post at 3 a.m. along a barricaded street, they were not members of the Presidential Protective Division (PPD). They were not on the president’s shoulder. At no time was the president’s security in danger. What damage did their stupidity do? Obviously, a lot to their personal lives, their marriages and their careers. Obviously, also, a lot to the image and reputation of the Secret Service. The legislation creating the Secret Service was sitting on Abraham Lincoln’s desk, waiting to be signed, on April 15, 1865, the night he was assassinated. In those days, the Secret Service was housed inside the Treasury Department, and its job was to protect and defend the currency and monetary instruments of the United States. It didn’t get the supplementary duty of protecting the president and vice president until after William McKinley was assassinated in 1901. All these years later, no agent I have ever met was hired for his sense of humor. These are very serious men and women who do their jobs very seriously. They have always been the best and the brightest. You can see it in the way they stand a little taller and walk with a different gait than others in law enforcement. You can see it in their pride. Frankly, I can’t think of any other law enforcement agency where pride counts as much as it does with the Secret Service. It’s the same pride that is always so visible with the U.S. Marines. That’s the reason why this scandal matters. Not because someone thinks the agency is out of control. It’s not. Not because of wildly exaggerated threats of blackmail. No, Chicken Little, the sky is not falling. It matters because the idiotic actions of 11 agents who forgot who they are and what their badge stands for deeply affects every active duty agent and tens of thousands of retired agents. Pride has been dented. And agents are, rightly, furious. These are men and women who have made — and continue to make — huge personal sacrifices for their share in that pride. The divorce rate among agents is high. That’s not because they party with hookers, but because for the privilege of wearing that special five starred badge, they abandon any thoughts of their time being their own. They miss birthdays and Christmas, Little League games, graduations, school plays, first teeth, first steps, first words. When the president travels, especially overseas, it’s a flying circus with 800-1,000 people, limousines, helicopters, communications equipment, big guns, small guns, sometimes food, and often 20-30 planes. As an integral part of this, Secret Service agents have two main concerns: To create and to maintain a tightly controlled environment in which the president can do his job safely and to bring everyone home at night. Anything short of that is, the way the Secret Service defines the word, failure.